FWA - Lee Wenyong & Co.
Lee Wenyong is approved by MOM to provide work-life consultancy & work-life training under the WorkPro Work-Life Grant, & is listed on MOM’s, SNEF’s and NTUC’s WorkPro websites. The Work-Life Grant provides funding & incentives for companies to offer flexible work arrangements (FWAs) for employees. The aim is to help employees better manage work and family responsibilities, & enhance the pro-family environment in Singapore. The Developmental Grant helps companies take steps towards implementing FWAs and other work-life programmes, and to defray part of the costs incurred. ​Companies can tap on either or both components. Please click on this link to learn more about the Workpro work-life grant for flexible work arrangements. We are proud to be featured in Channel News Asia, showcasing progressive FWA work culture & practices. ​Channel NewsAsia Singapore was established in March 1999 by Mediacorp, and is an English language Asian TV News channel. Mediacorp is Singapore’s leading media company with the most complete range of platforms, spanning television, radio, newspapers, magazines, movies, digital and out-of-home media. 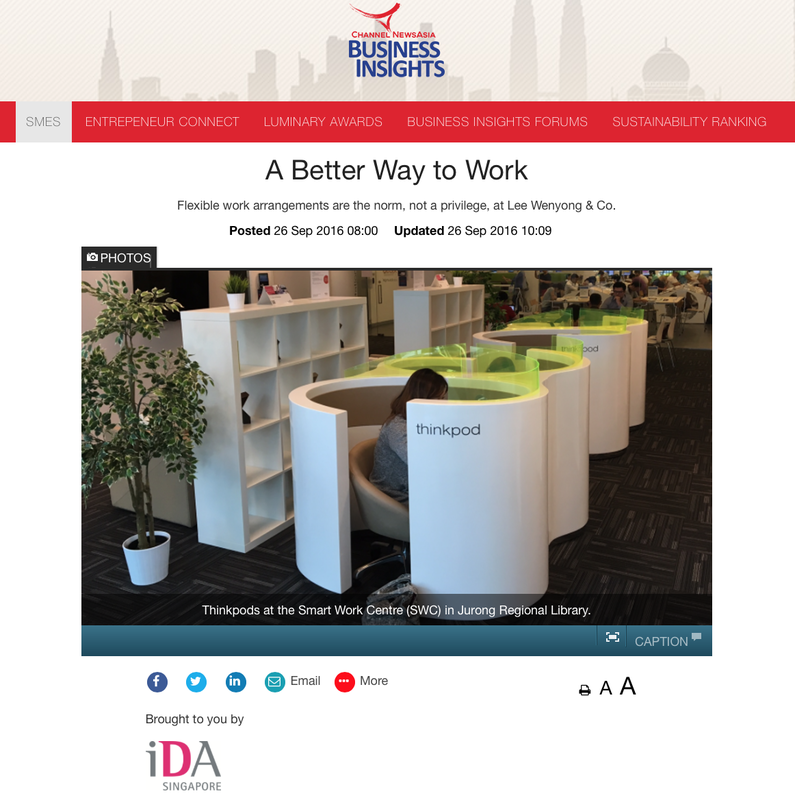 2 of our employees, Derica Chan & Glen Keith Chan, are featured in the Regus corporate video promoting flexible work arrangement through the use of Smart Work Centres. IDA's initiative to set up Smart Work Centres around Singapore brings work closer to homes & the community. With centres located in residential hubs & conveniently accessible via public transport, employees can work closer to home. 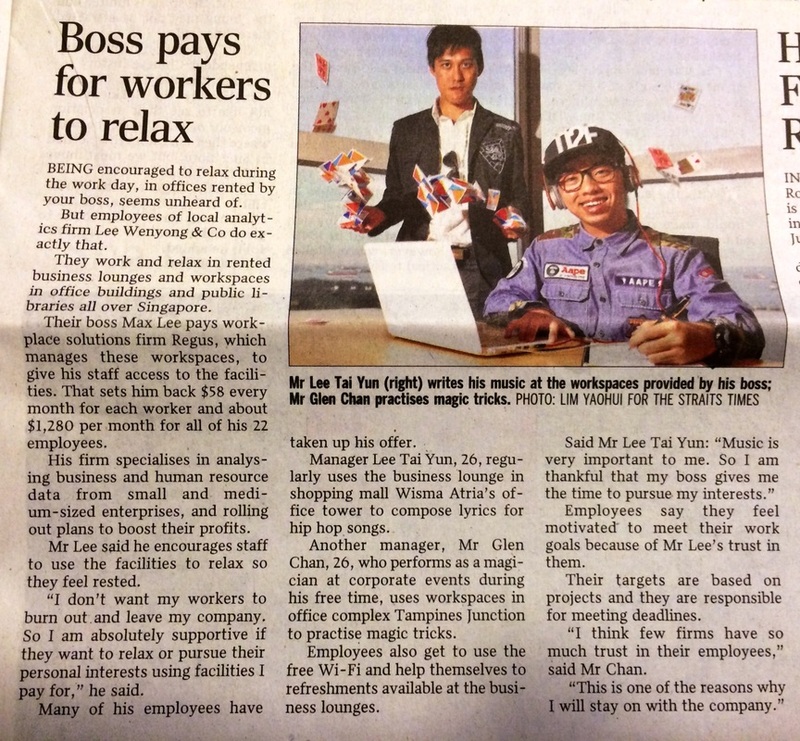 We have been featured in The Straits Times in the Home section, & in STJobs.sg. The articles describe how Lee Wenyong & Co. allows employees to pursue their personal passions at the workplace, to boost productivity, maximize creativity, ensuring retention of high performers. 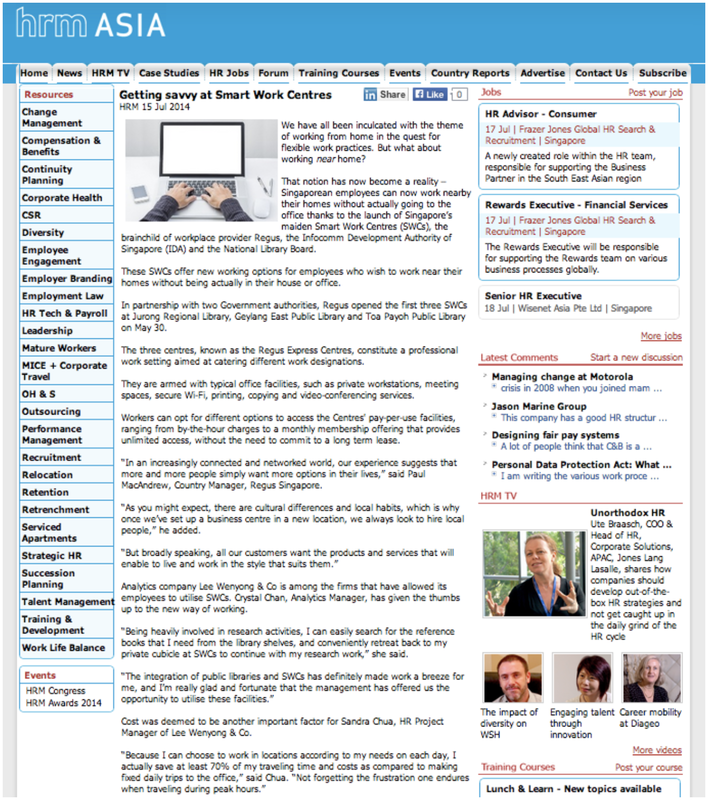 Managers at Lee Wenyong & Co. manage outcomes, not behaviours. What Lee Wenyong & Co. practices is a prime example of how work has become such a big part of our lives, that all employees need to strike a balance. Since people spend so much time at work, there's no harm injecting leisure at work. It is about employers learning to trust their high performing employees. Lee Wenyong & Co. have been published again, this time in HRM ASIA. The article recognizes Lee Wenyong & Co. as a supremely progressive, cutting edge employer who trusts employees, by viewing work as an activity, not as a destination; where employees are paid for the value they create, not for face time at the office. We are the poster boys for Singapore's Smart Work Centre (SWC) initiative, which is a collaboration between the Infocomm Development Authority of Singapore (IDA), the National Library Board (NLB), & Regus. SWCs offer new working options for employees who wish to work near their homes without being actually in their house or office. To read the article, you can either click on this link, or you can refer to the story in our "News" section which is replicated from www.hrmasia.com. If you live in Singapore, you’ve probably had to listen to a lot of people tell you how busy they are. It is, pretty obviously, a boast disguised as a complaint. They’re busy because of their own ambition or drive or anxiety, because they’re addicted to busyness & dread what they might have to live with in its absence. Almost everyone I know is busy. They feel anxious & guilty when they aren’t either working, or doing something to promote their work. Even children are busy now, jam-packed with violin lessons & abacus arithmetic. They return home at the end of the day as dog-tired as their working parents. The present busyness hysteria is not an inevitable condition of the Singaporean lifestyle. It’s something we’ve chosen, if only by our acquiescence to it. A month back I spoke to Jason, a dear friend & a colleague & a mentor whilst I was an employee at CapitaLand, who is now working on a flexible work arrangement. He describes himself as happy & relaxed for the first time in decades. He still gets his work done, but it doesn’t consume his entire day & brain. He remarks that it feels like college again — he has reconnected with a large circle of friends, all of whom head out to the bar every week. Great news! He has time for a girlfriend again. 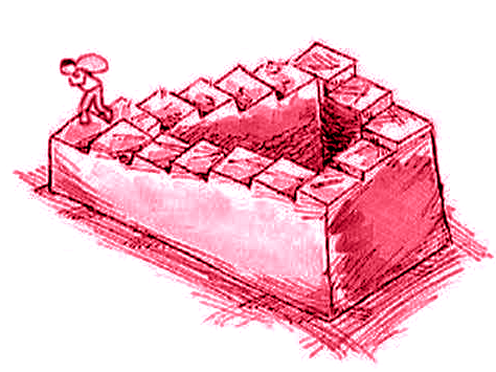 Busyness serves as a kind of existential reassurance, a hedge against emptiness. Obviously our lives cannot possibly be silly or trivial or meaningless if we are so busy, completely booked, in demand every minute of everyday. I have a friend, Joanne, who currently works at an investment firm where she isn’t even allowed to take lunch hours out, lest she be urgently needed for some work-related reason. It’s hard to see through this pretence of indispensability as anything other than a form of institutional self-delusion. I can’t help but wonder whether all this histrionic exhaustion isn’t a way of covering up the fact that most of what we do doesn’t matter. I am not busy. I am the laziest most ambitious person I know. Five hours of productive research each day excluding weekends is enough to justify my existence on Earth. On the best ordinary days of my life, I work hard in the morning, then in the afternoon I go for a leisurely drive to pick my wife from work, & in the evening I see friends, read to my wife or sew leather pouches. This to me is a sane & pleasant pace for a productive day. And if you happen to call me to ask if I could perhaps blow off work & head down to the Singapore Cricket Club & drink chilled gunner cocktails, I will reply, what time? Alas! Only just in the last couple of weeks, I’ve insidiously started, because of extra-curricular obligations, to become busy. For the first time I was able to tell people, with a straight face, that I was “too busy” to do this or that thing they wanted me to do. I could see why people enjoy this complaint. It truly made me feel important & sought-after. Except that I hate being busy. Every morning my inbox was full of emails asking me to do things I did not want to do or presenting me with problems that I now had to solve. It got more & more intolerable until finally I fled to my favorite bench at East Coast Park from which I’m writing this. Here I am largely uninterrupted by obligations. My iPad & iPhone are switched off. Idleness is not a vacation, an indulgence or a vice. It is as indispensable to the brain as vitamin C is to the body. Deprived of it we suffer a mental affliction as disfiguring as scurvy. My own resolute idleness has mostly been a luxury rather than a virtue. But I did make a conscious decision, back in 2007, to choose time over money. I understood early in my career that the best investment of my limited time on Earth is to spend it with people I love, not to fritter it away by over-working in juggernaut multi-national companies that wring you dry & leave you out hanging upon retirement. It’s possible I’ll lie dying regretting that I didn’t work harder to earn enough to purchase a Lamborghini LP507-4 Superleggera. But I believe what I’ll really wish on my deathbed is just five more minutes of hand-holding strolling down East Coast Park with my beloved wife Phuc, one last hearty laugh shared with my brother Ming, & one final late night custard bun supper with my good friend Huimin. Life is too short to be busy. P.S. Kudos to you for not being too busy to read my article.